With the Marine Corps Marathon set for Sunday, Metro has made some changes to hours and weekend daytime track work. Here's what you need to know, including what stations to head for. WASHINGTON — Red Line trains will single-track near Medical Center this weekend, but all Metro stations are open as the system anticipates a significant number of riders for Sunday’s Marine Corps Marathon. Race organizers made a $200,000 deposit to get Metro to open two hours early Sunday morning. From the 6 a.m. opening until 8:30 a.m., the Pentagon station will be exit-only for marathon runners to reach the start line. To avoid the crowding there, Pentagon City is also an option. Arlington Cemetery station will be closed until about 8:30 a.m.
Due to the crowds, Metro plans to run more Yellow and Blue Line trains than a usual weekend before and after the race — from 6 a.m. to 9 a.m. and from 11:15 a.m. to 4:15 p.m. Runners taking part in the MCM 10K, which starts on the National Mall, can use the Archives or L’Enfant Plaza stations, among others to reach the start line. Because of the race, all Metrobus service that normally runs to or from the Pentagon will instead run to Pentagon City all day Sunday. On Saturday, buses will also be diverted to Pentagon City until 2 p.m. due to the MCM Kids Run. At Rosslyn on Sunday, the MCM Finish Festival will divert all bus service from the usual stops in front of the Metro station to North Oak Street, two blocks west. Last year, Metro rejected the marathon’s request for additional hours, which led to changes to the race. Find a list of road closures and a route map. 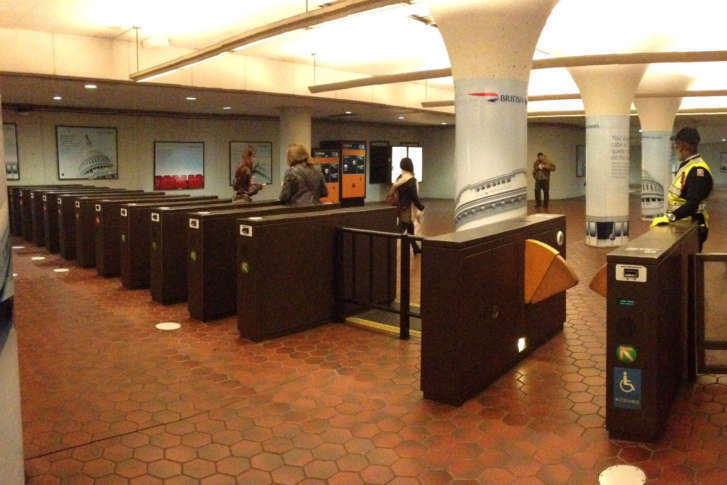 Metro now closes at 1 a.m. Friday and Saturday nights, 11 p.m. Sundays and 11:30 p.m. weeknights. Red Line tunnel seal work means trains are only scheduled every 15 minutes this weekend between Shady Grove and Glenmont. Trains are single-tracking between Medical Center and Grosvenor. Next weekend, Metro has scheduled a complete shutdown of the Red Line in that area. During the day, there will be additional Red Line trains scheduled between Farragut North and Silver Spring. The Orange, Blue and Silver lines will have track work after 10 p.m. Friday, Saturday and Sunday. After 10 p.m. each day, Blue and Orange line trains will single-track between Foggy Bottom and Clarendon/Arlington Cemetery, and Silver Line trains will only run between Wiehle-Reston East and Ballston. There is no track work scheduled on the Green or Yellow lines.